You’ve just got to try my Chocolate Thumbprint cookies! One bite and you’ll be hooked for life! I dare say that these are my favorite cookies of all time. But before we rush into the easy recipe, let’s talk butter. If you’ve been reading my blog for very long, you know that I’ve always been a butter snob. I’ve even begged, pleaded and politely requested that no substitutes be made for the real deal in my recipes. 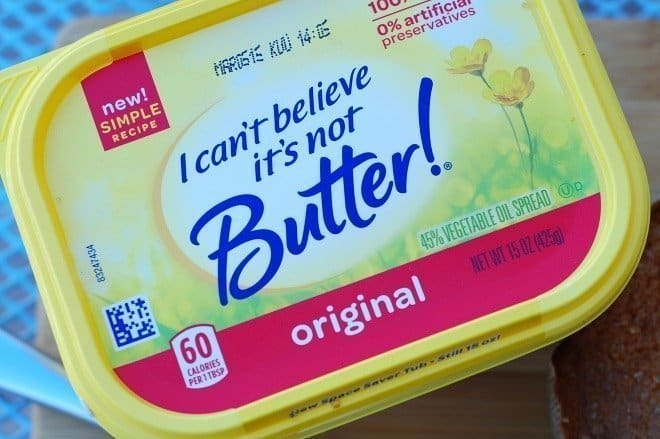 That was before I tried the new I Can’t Believe It’s Not Butter, made from real simple ingredients (you know I’m all about simple) like a delicious blend of plant-based oils, purified water and a pinch of salt. This new recipe is also offered in the original, light and olive oil varieties. The best part: The new I Can’t Believe It’s Not Butter!® spread has 40% fewer calories and 70% less saturated fat than butter. And because no one can eat just one of my Chocolate Thumbprint Cookies, that’s good news! My chocolate and walnut cookie is not overly sweet, but then you bite into the frosting and the milk chocolate candy center and there’s a burst of sweet, chocolaty goodness. Am I being over dramatic? Not at all! It’s like a little slice of heaven on earth! When I mentioned to my daughter that I was going to try the new I Can’t Believe It’s Not Butter in my cookie recipe, she informed me that she’s been using it exclusively for years and loves it. Then I let her in on the secret that it was new and improved. Ha! These cookies are the perfect treat to have on hand for the holiday season and especially a cookie exchange party! And who wouldn’t love to get a tin of these chocolate thumbprints for Christmas? Helpful Hint: Don’t forget to try the new I Can’t Believe It’s Not Butter for all of your holiday baking! I like the fact that it’s spreadable straight out of the refrigerator, so there’s no need to wait for it to soften! Don’t you hate waiting for butter to soften? 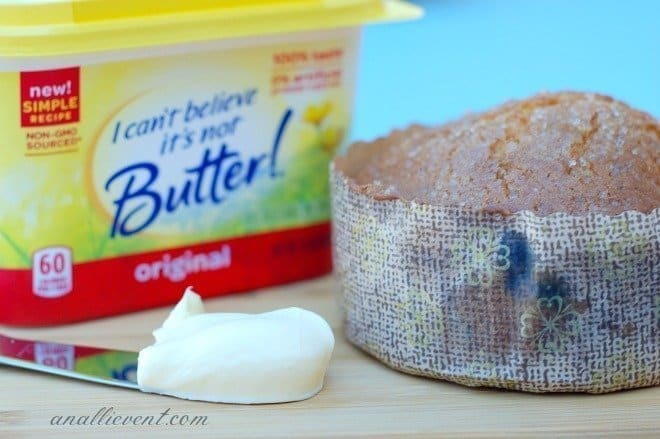 I Can’t Believe It’s Not Butter!® can also be used for spreading on blueberry muffins, multigrain toast, topping corn on the cob, and sauteing veggies. For more great-tasting recipes, click here! It’s Wednesday morning and I am already craving dessert. 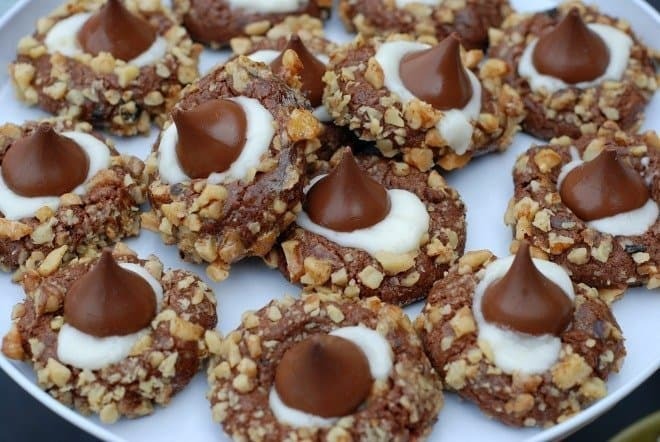 These Chocolate Thumbprint cookies look delicious. They really hit the spot when I’m craving chocolate! Well, now I will give ICBINB a try again. Good info on them. Those cookies are calling my name! Thumbprints are always good and yours take it to another level with that filling! The filling and the walnuts really amp up the flavor! Of course, I’m still drooling over your waffle iron corn bread. I’m sharing it on my FB page today. Cornbread is my favorite bread! These look yummy. I can’t wait to try them. These look so yummy! I hate to wait for butter to soften but I never thought of using I Can’t Believe It’s Not Butter for baking. I’ll have to give it a try this year! I hate when I forget to take the butter out to soften and try to microwave it and it never gets to the right consistency. Those look soooo good! Unfortunately, walnuts break my mouth out. Have you ever tried them with pecans? Just wondering if that would be a good substitute for me! Beth@That One Mom recently posted…Cider Brined Turkey & A Thanksgiving Menu! Oh, yes, pecans would make a great substitute. I love that these cookies are made with walnuts. Sometimes I find thumbprint cookies to be a little too simple / wanting texture. Besides, I’m on SUCH a walnut kick right now. I love all nuts, but especially walnuts and pecans and these cookies really deliver on taste. I love “I Can’t believe It’s Not Butter” and these cookies look so delicious! I can’t wait to try them!!!!!! They are so good, Chastity! The grands loved them, too! Forget about the butter, let’s talk about the cookies!! LOL! They look so tasty for real! I will have to get some of this butter because I love baking all kinds of junk! And less calories and fat is better for the body anyway! They look Delish! Will def have to try them out….next time you make them! I have to say that making the thumbprints is a whole lot of fun! Alli these are the PERFECT treat for the upcoming holiday parties. I know these would be a hit. It’s really good, Ashley! Hope your family loves it as much as my family does! These look so delicious – I make a similar recipe but I want to try yours! This looks wonderful. I’ve made similar cookies before, but I haven’t tried it with a butter substitute…will give this a try. Cookies are my favorite! Adding this one to my recipe book. Thanks! I just love your Thanksgiving tablescape, Ashley! You really transformed those thrift store placemats into a work of art! They really are my fave cookies! 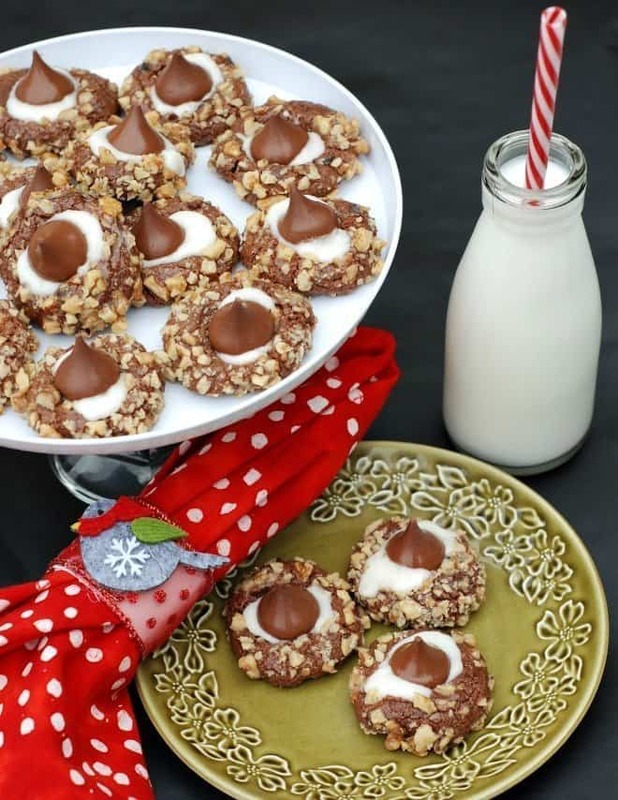 These look delicious and perfect for a cookie exchange party! I just pinned this to try later! Sarah Sofia Knepp recently posted…Santa Claus is Coming to Town…Personal Invitation to Meet Santa with no lines + GIVEAWAY! Yum!! Cant wait to try them! They really are good and now I’m thinking about getting my boots all shined up with your helpful tips! Oh my this looks wonderful. Never tried I can’t believe it’s not butter, after seeing this I will give it a try!!!! They have lots of yummy recipes on their website, Melinda. You can click through to it from my site. Wow! Since I’ve taken on most of the baking for my family, I’m always looking for something different to go with the traditional. 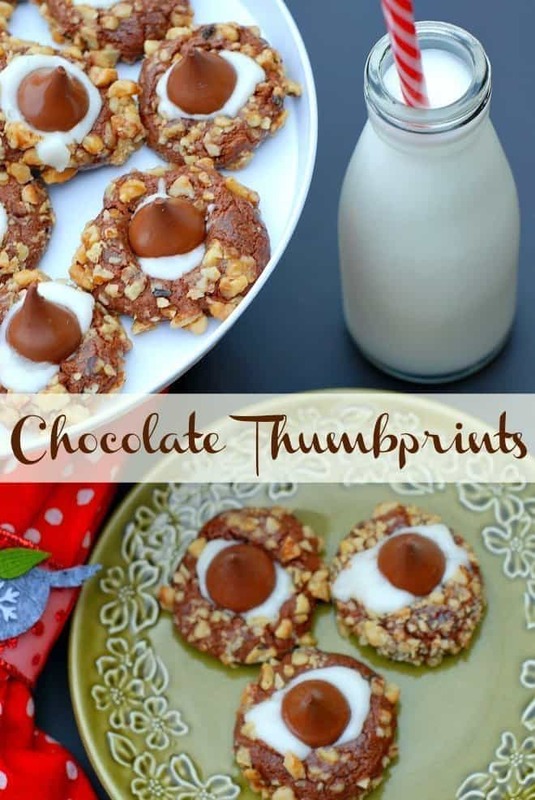 These Thumbprint cookies get a ‘thumbs-up’ from me! Thanks, Marilyn! My family loves them! Thanks! I’ll be making them again real soon! These cookies look delicious. A perfect cookie to add to my Christmas cookie list. Those cookies are gorgeous! And I love I Can’t Believe It’s Not Butter! I have several varieties of it in my fridge right now! What a super fun thumbprint cookie!! And I will have to keep my eye out for that butter spread…I always forget to get my butter out early! These look delicious. I am going to bake some for Christmas. You’re right I don’t like to wait until the butter softens. Will add I can’t believe its not butter to my grocery list. Alli, these look so delicious! I can’t believe it works. I also love the filling that you add before putting in the chocolate kiss. That makes this recipe look so much better than the regular. Delish! Pinned. I have always been a butter snob as well, but these look amazing. I might just have to give this updated spread a try, particularly if I don’t have to wait to bake while the butter softens. Just pulled the Thumb Print cookies and they look delicious. Thanks for posting them and I will look for more.